Old black formwork panels, used for pouring concrete, form a cubic installation, Black/White – faintly reminiscent of an Architekton? A temple-like platform? Or rather a humorous quote on 3D Tetris? 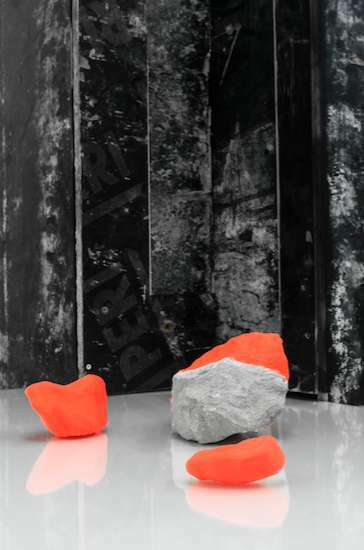 Scattered over the black/white surfaces are neon orange stones – which are indeed plastic 3D printed objects of no distinctive form. Artificial objects meet found, used materials, construction and planning meet nature meet “function-less” creation. Visual artist Bram Braam (NL, 1980) is fascinated by the opposites of man-made and natural creation in our everyday surroundings. 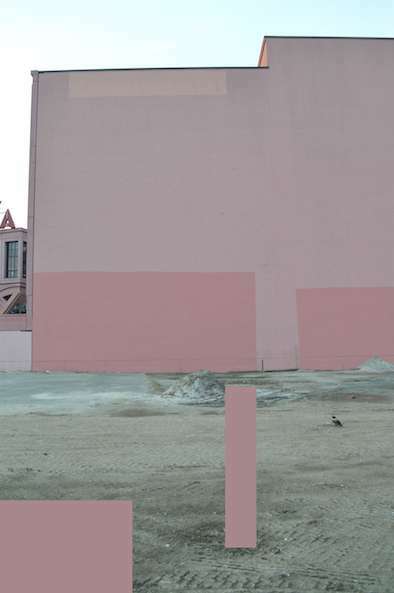 Being a sculptor, he not only works with objects and site-specific installations, but also collages, assemblages and photographs – such as the photo series Accidental Visions: Braam photographed the anonymous “‘non-spaces” in Berlin, which he later digitally transforms. Modernist urban areas, often neglected, at the threshold between old and new, inspire Braam’s work. He is fascinated with modernist architecture and design, the “beautiful” as well as the “ugly”, constantly questioning how nature and culture, how original/real and artifical construction are perceived. Currently, Bram Braam’s works are shown in a solo show at Galerie Frank Taal, Rotterdam: Welcome to the real world (11.11.2016 – 17.12.2016). 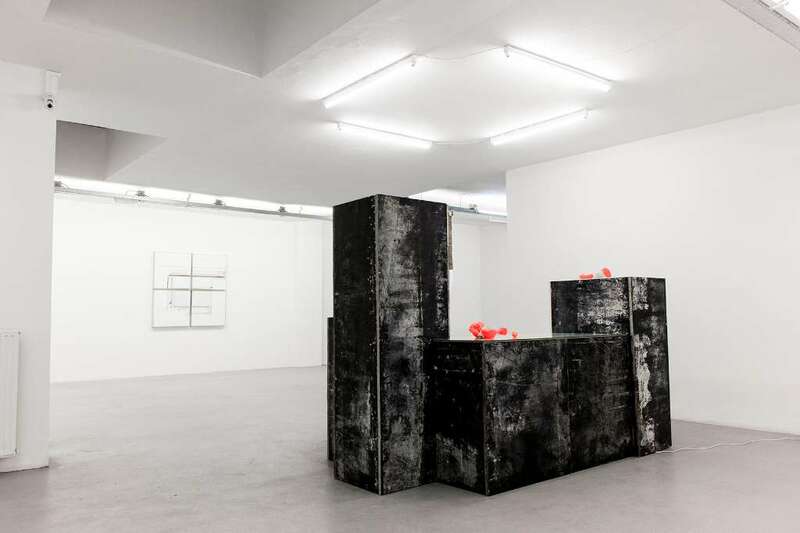 He is represented by Frank Taal Gallery in Rotterdam and Galerie Burster in Berlin. With deconarch.com, Bram Braam talks about his latest show, reveals his fascination of modernist urban architecture and describes how his works evolve and come into existence. 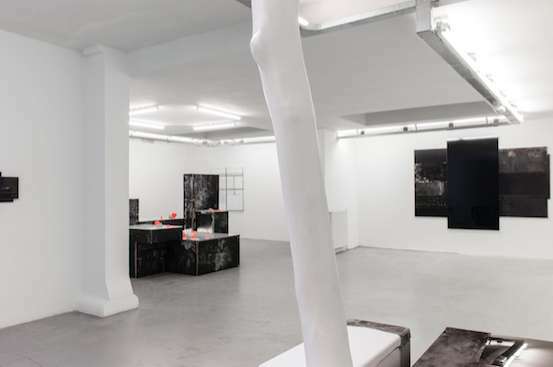 Currently you Welcome to the real world in your solo show at Galerie Frank Taal in Rotterdam. What is it about? The concept of French philosopher Jean Baudrillard about hyperreality is fascinating. “Upper reality”, literally. It’s a world that is created to simulate and to improve the natural reality. In this world the images can refer to something real – a technical world where everything is fine and where there is no distinction between fakery and reality. In the works shown at the exhibition I play with contradictions, between raw and polished, perfection and imperfection, chance and control, fake and real, reality or illusion. In the large scale installation black/white I bring together different influences and realities. The exterior of the installation is constructed from weathered black plates used for pouring concrete on construction sites, a reality between the planning phase and execution. You can see references to modernist architecture, where the imperfection is precisely expressed. The inside shows a completely different scene, consisting of gleaming white glass plates and glass display cases with bright white lights shining on the white surfaces like a setting for a decor or a storefront from a shop. It is a sophisticated version of reality with no room for chance or failure. On the white surfaces lay ten “stones” that are semi-covered in 3D printed Fluor orange plastic. You mention references to modernist architecture, an important part of your work. What make modernist architecture and design so interesting to you? My interest in modernist architecture began during my studies at the Royal Academy of Arts in Den Bosch. I was interested in the way we design our landscapes and how this has evolved in the past. Looking back to the old plans from the new realised utopias of the 20th century, it fascinated me that this modernist style movement was an absolute break from the past, and a turning point towards the evolvement of our contemporary architecture. It’s also a bit of a love/hate relationship with modernist designs, as there are plenty of examples that are an absolute disaster. It’s interesting to see how different the outcomes are if you look to the inhabitants of Chandigarh in India, for example, or Brasilia by Oscar Niemeyer. Nevertheless what’s attractive to me is also the purity and roughness of brutalist architecture and the use of raw concrete – as a sculptor I can look at it from different viewpoints, so I can see the beauty of ugliness in things around me. How is your working process? It is a complex mechanism, I think, how the works evolve and take shape. It always starts with ideas which come back to me until the point when I finally want to do something with them – once they’ve been in my head for a period of time I know that they could really be something. Sometimes it takes half a year before I finally work on them. The good thing about this is that the idea changes all the time and combines different plans which melt together, and can form a better work than the original idea. My ideas never come up in my studio but everywhere else, when I am laying in bed or taking a shower or sitting behind my desk at home. I write things down make drawings and sketches and build maquettes and some of them I realise. My studio is a real working space to physically build something, but the whole research and planning phase always takes place behind my desk before this. Where do you find your motives and topics? I work with certain topics that you can trace back through all my works. For example my photo series accidental visions. I took photos of places in the city of Berlin where unintentional artistic references to modernism had emerged, like when people re-paint a wall to cover over some graffiti, and they use a slightly different colour than the one used on the original wall, not too clean, not too perfect. I like to see these imperfections that are awkwardly created. Here I added a really strict shape on the computer And I show the coincidence against the planned, the controlled versus the uncontrolled. Topics that you can see coming back in all my works. You are working with site-specific installations usually – how does the spatial situation “on site“ influence your work(s)? Mostly I create works specific for a space. I always build them first in my studio, and try to recreate specific measurements from the exhibition space so that I have a bit of an idea of the volumes. Also, for this exhibition I took care of the size of the installation and where it will be placed. (But because) I build everything beforehand, and I generally won’t change anything on site, so in this sense the site only affects the work partly. What materials are you working with? Why? What possibilities do they offer? For me, surfaces are very important in my work, I’m referring to architecture and walls outside, therefore I work a lot with wood that can express this well. But in a way, the material doesn’t matter and depends on the idea. That comes first and then I start thinking about how I could realise it – from welding with steel to working with glass, plastic, stones and concrete. Are there role models, particular influences, which inspire your work? Yeah definitely, I’m inspired by the De Stijl movement, constructivism and architects such as Gerrit Rietveld and Le Corbusier. From the older generation you can see the influence in my work of Mondriaan, Donald Judd, Sol LeWitt, Tony Smith, and my hero, Gordon Matta-Clark. 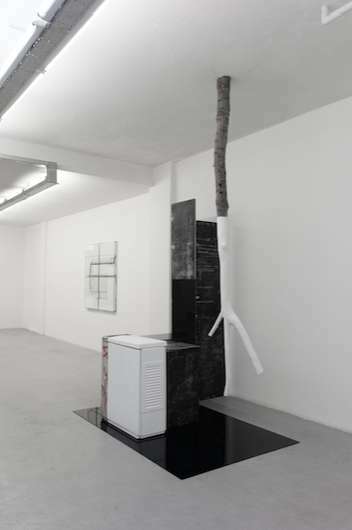 From the younger generation I like the work of Oscar Tuazon very much, with his poetic works in raw material, but also artists as Sterling Ruby, Cabrita Reis, Michael Sailstorfer, Eberhard Bosslet and Guillaume Leblon are artists that I admire. Besides inspiration from other artists, I can get inspired by landscapes, architecture and the hectic urban environments we live in. Bram, thanks for sharing your work with us!